Columbia Association’s Board of Directors is considering proposing a change to Maryland state law that would recognize CA as a brand new type of entity called a “community benefit association” instead of as a homeowners association, or HOA. Columbia was founded as a community unlike any other in Maryland. Columbia Association, which manages Columbia, is very different than typical homeowners associations. Recognizing Columbia Association as a community benefit association would distinguish CA from traditional HOAs — and acknowledge CA’s unique role in focusing on the quality of life for the entire community in Columbia. Please send questions or your input to CBA@ColumbiaAssociation.org. Why is this legislation being proposed? By being identified as a community benefit association, CA would no longer be subject to legislation that is clearly intended for smaller HOAs. CA would instead be recognized under state law for how unique it is. The way CA is organized, and the way it operates and functions, make it very different than every other HOA in the state. When state lawmakers consider changes to the Maryland HOA Act, they are considering changes that are intended for the much smaller, traditional homeowners associations that you might think of when you think of an HOA — more on that below. Many of those proposed changes could have very significant, unintended negative consequences for CA. CA has fortunately been able to protect itself and the community from these negative effects by obtaining amendments or exemptions to HOA Act legislation. But CA can’t ensure that it will continue to be successful in the future. CA wants to make sure your rights are protected. By law, nothing will be different in the way Columbia Association conducts its operations. As a community benefit association, CA would still be required under its bylaws and state law to provide the openness mandated by the HOA Act. Anyone who lives or works in Columbia, or who owns property in Columbia, would still be able to attend and comment at all open work sessions and meetings of CA’s Board of Directors. You would also still be able to inspect and copy CA’s books and financial records, including salary information. What happens if there’s an amendment to the HOA Act that would be beneficial to CA and the community? CA would request that members of the Howard County delegation sponsor legislation adding similar amendments for community benefit associations. Isn’t CA already both a corporation and a homeowners association? Since its founding in 1965, CA has been classified under Maryland Corporations Law as a private, non-stock corporation. When the state HOA Act passed in 1987, CA was classified as a homeowners association as well. There are currently no other community benefit associations in Maryland. This new designation would reflect CA’s unique role. How is CA so different from other HOAs? No homeowners association in Maryland is as big as Columbia Association or provides as many services and programs. CA benefits more than just homeowners — it also serves renters, businesses and the people who work in Columbia. CA is unique in its role and does not really fit within many parts of the Maryland HOA Act — a law that was passed nearly two decades after CA was established. Many HOAs have only a few dozen properties. CA has a population of about 100,000 people and 33,000 properties. The next biggest HOA in Maryland is Montgomery Village, which has about 14,000 properties. Additionally, about one-third of CA’s annual charge revenue comes from commercial properties, unlike other HOAs that include only residential and not business properties. 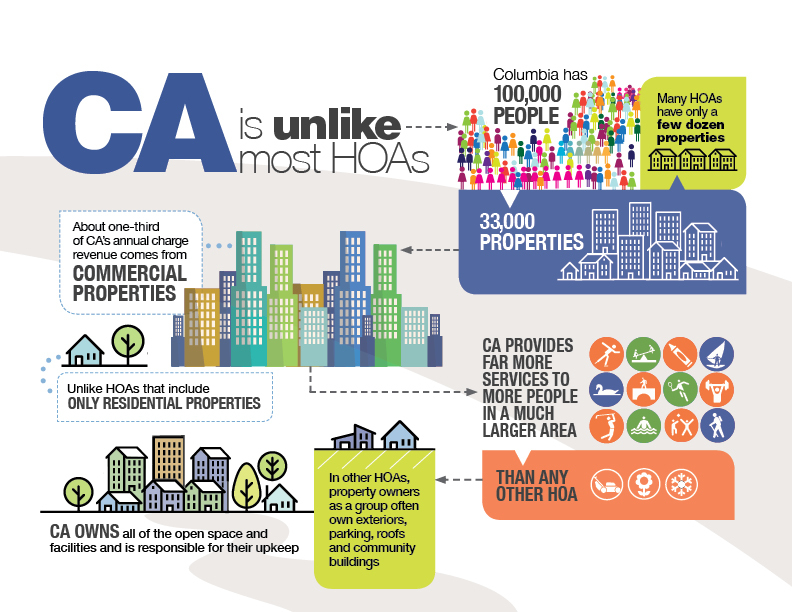 CA provides a greater number of facilities, programs and activities to many more people in a much larger area than any other HOA. CA is the only HOA in Maryland that can issue bonds to fund capital projects. And unlike other HOAs, CA rather than the property owners as a group owns all of the open space and facilities, and therefore is responsible for their upkeep. In other HOAs the property owners as a group are often the owner of roofs, exteriors, parking, community buildings, etc, which is why many of the provisions of the Maryland HOA Act and proposed amendments address issues that small HOAs have had in the past with insufficient reserve funding, insurance and inadequate internal controls. What are some examples of legislation that could have negatively affected CA and the community? When new legislation is introduced to try to change the Maryland HOA Act, it’s usually in response to a problem at a much smaller homeowners association that does not have the kind of structure, professional management staff, or internal controls that CA does. One example is legislation that would have required HOAs to send a printed budget to every homeowner. For smaller associations, that might be 20 or 30 printed budgets, each no longer than a few pages. For CA, that would have meant printing and mailing 33,000 copies of a budget that is more than 400 pages long, a considerable and unnecessary expense. CA’s budget is already posted online, along with other financial reports, at ColumbiaAssociation.org/budget. Printed copies are provided to each of the 10 village community associations for community members to access. Because almost all HOAs in Maryland lack professional in-house staff like CA’s, there was a series of legislation that would impose licensing requirements on community managers. That would have meant several hundred CA employees would have been unnecessarily required to take exams, serve apprenticeships and obtain and renew licenses, at considerable cost to CA and to the detriment of our operations serving the community. Another piece of legislation would have required every HOA to register with the state and pay an annual fee based on its number of properties. While that fee would likely be insignificant in the case of an HOA with only a few dozen properties, even a fee of only $1 per property would have cost CA $33,000 annually. These are just a few examples. Between 10-20 HOA Act amendments are introduced each year. The quantity seems to be increasing. CA regularly seeks amendments to or exemptions from this legislation, because it does not really apply to an organization like Columbia Association. CA has been successful in avoiding the negative effects of this legislation. Why can’t CA just continue what it’s been doing? There is no guarantee that this success will continue. When new legislation amending the HOA Act is proposed, CA must persuade state legislators that the impact on CA would be vastly different than the effect on other HOAs — and that the impact would be detrimental. It is very possible that legislators might not be persuaded of these facts when considering future proposed legislation. The lawmakers in Annapolis who oversee HOA Act legislation have suggested that CA propose a comprehensive solution — a bill recognizing Columbia Association for its unique status. Beyond that, recognizing CA as a community benefit association would save resources. CA dedicates a significant amount of legal fees and time to reviewing, acting on, testifying and lobbying, and crafting amendments to the increasing amount of HOA legislation introduced every year. This money, time and staff could instead be redirected to serve the community in other ways. Are there any other community benefit associations in Maryland? No. This would be a brand new entity reflecting CA’s unique role. The “community benefit association” would be recognized under Maryland law as a type of corporation. Maryland recognizes several different types of corporations. The newest type is a “public benefit corporation.” However, CA does not completely fit within the definition for that type of corporation. How does this affect me as a resident or business owner? Nothing will be different in the way CA conducts its operations. If CA becomes a CBA, will this change the relationship between CA and the villages? The relationship will not change. For example, CA will continue to provide funding to the villages via the annual charge assessment share and will continue to assist the villages in lawsuits to enforce their covenants. CA considered a similar measure several years ago. At that time, the village community associations were included in that proposed legislation. Why have they not been included this time? In 2012 and 2013, the proposed legislation included Columbia Association and all 10 of Columbia’s village community associations and would have required that they all participate. However, some of the villages were not interested in participating, which meant CA could not proceed. This time, CA is considering pioneering the new CBA legislation. Each village can decide on its own — and on its own time frame — whether to opt in. Village community associations can observe CA’s experience and fully evaluate how the proposed CBA legislation could benefit them and their communities. Each village community association can decide whether this is the right choice for them. If CA becomes a CBA and the village community associations remain HOAs, who will lobby in Annapolis for the village community associations? CA will continue to monitor legislation in Annapolis, including proposed amendments to the HOA Act, and will inform the village managers when matters arise that CA thinks may impact the village community associations. The village community association boards would then need to decide what, if any, action to take — and CA would help get the villages’ letters to the appropriate legislators. CA also would let the villages know the dates of hearings for bills on which the villages decide to act, so that the villages may decide whether to give testimony. The draft legislation defines a CBA as having more than 20,000 lots. How would villages be allowed to become CBAs? CA would seek an amendment of the definition of a CBA so that the affiliated villages would not need to meet the 20,000 lot definition/requirement. Why can’t this wait until next year, so the villages have time to decide whether to participate? As mentioned previously, CA is unlike other HOAs. There is a strategic need to be recognized as a unique entity rather than continue with the same level of lobbying efforts each year. During the last two legislative sessions alone, CA followed 55 bills filed in Annapolis, of which 32 were HOA bills. Of those 32 HOA bills, CA was compelled to seek amendments to or exemptions from 22 because of the bills’ significant, unintended negative consequences for CA. Given these facts, CA’s Board of Directors has been discussing this proposal and working on the language of the actual bill and materials to provide to the public to explain the proposal. Since the bill can still be filed in this legislative session, there is no reason to wait until the 2020 session. The timing of CA’s proposal does not affect the villages, who can make their own decisions within their own timeframes.